Volunteers are essential to the work we do, providing help and support to vital services from socialising our puppies through to driving and working in the office. 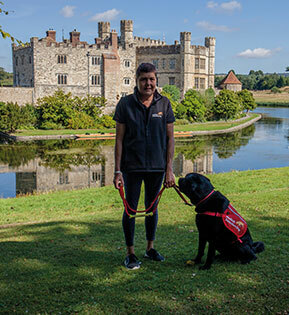 If you enjoy fundraising and want to make a real difference to the work we do then why not become an active fundraiser for Medical Detection Dogs? You can have fun, build up your CV, meet lots of new friends, learn new skills and contribute directly to a really worthwhile cause. 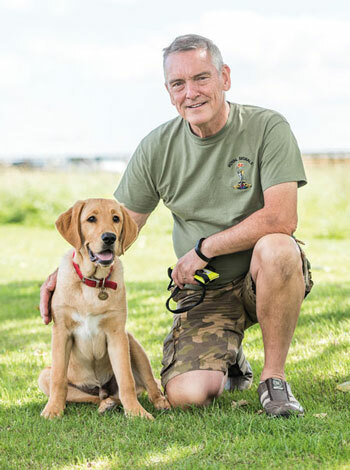 The charity is funded purely by voluntary contributions, without our fundraisers Medical Detection Dogs cannot continue to support people with life-threatening health conditions. We are looking for people from all over the UK to help us fundraise, whether it’s collecting at a local supermarket, taking part in a fun run, or organizing an event. It doesn’t matter how much time you can give – some events are one-offs and others require a greater commitment, but everyone can get involved. Collection Box Co-ordinators If you have very little spare time, but would still like to make a BIG difference to the charity, you could leave collection boxes with local businesses such as vets, petrol stations, chemists, bakeries, newsagents, pubs, hairdressers, garden centres or pet shops. The role of ‘collection box co-ordinator’ includes identifying potential box sites, picking up the boxes when they are full, leaving new boxes in their place and then counting and banking the money for Medical Detection Dogs. Attend regular local puppy classes? Be at home most of the day? Follow positive dog training methods? Regularly visit lots of different environments and use various forms of transport to socialise a puppy? Be willing to support charity events? Have a secure, dog-friendly garden? Have the time and stamina to manage an active puppy? Have the ability to travel to weekly classes at the Centre or local area? We sometimes require full-time foster families to look after one of our Bio-Detection Dogs. These dogs live in the home environment as a general pet dog but have special qualities that we wish to use. They will need to be transported to our centre up to 4 times a week for periods of time when they are involved in training for particular projects. This is mainly a long term commitment, but we do need foster homes for shorter periods of time on occasions. In return you will receive the general enjoyment and rewards of looking after a special dog. We provide food and equipment for the puppy and cover all veterinary costs. If you can provide a loving home environment to one of these dogs and are willing to transport the dog to our centre when required then please contact our Puppy Training Support Coordinator Pam Jones Email helen.bliss@medicaldetectiondogs.org.uk or telephone 01296 655888 or apply here. Are you a people person? Would you like to interact with lots of interesting people both face to face and via telephone in a unique environment? If so consider joining our Reception team at the Centre at Great Horwood. The primary function is to provide a first class, professional and warm service to telephone callers and visitors to the charity. Excellent telephone manner needed, attention to detail and email skills vital to ensure messages are passed on accurately to the correct person. This is a position that requires a regular time commitment. 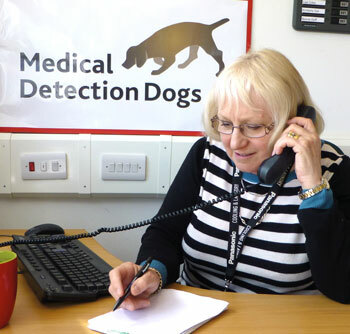 If you are interested in volunteering please contact our Volunteer Coordinator: email volunteering@medicaldetectiondogs.org.uk or telephone 01296 655888 Or apply here. 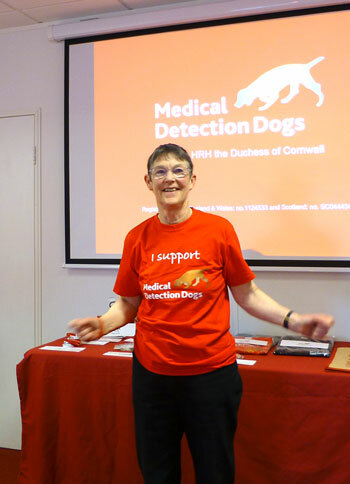 Medical Detection Dogs need a national network of speakers to help promote awareness of the charity and raise funds to support and train our dogs. The role is an important one as often this is the first time that people will have heard about the charity. Speakers also raise much needed funds and encourage others to fundraise in various ways for example by leaving a legacy in their will or organising a fundraising/sponsored event on our behalf. What type of groups do speakers address? Speakers visit groups such as Lions and Rotary Clubs, Women’s Institutes and Guilds, Brownies and other similar youth groups, schools, etc. How will I know what to talk about? We have produced materials to support anyone speaking on our behalf. We organise ‘Speakers Training Days’ and offer the chance to visit our training centre at Great Horwood. The training sessions include the sharing of ideas, tips on addressing audiences, and up-to-date information, as well as giving you the opportunity to meet other speakers and members of staff. It is possible that regional training sessions could be oganised, depending on numbers. How will I keep up to date with relevant information? A newsletter is sent to all voluntary speakers giving up-to-date information and stories to help you keep your talk current and relevant. You will also receive regular puppy updates and charity newsletters. How many talks would you expect me to give? This is entirely up to you! We just ask you to do as many, or as few, talks as you wish that are convenient to you. How far would you expect me to travel? Again this is your choice. How are talks allocated? If a request is received at Head Office it is allocated to the nearest speaker who is available at the time of day required. You are also welcome to organise your own talks. Regional support groups are an essential part of Medical Detection Dogs. They can raise valuable funds and encourage local support as well as inspire others to help us. We are looking to establish a national network of groups. What do groups do? 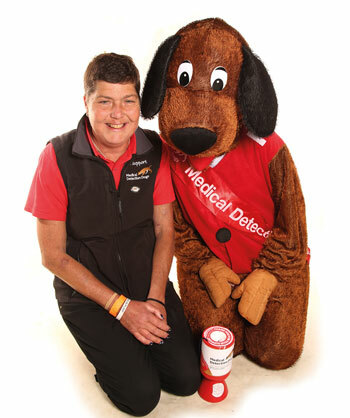 Groups raise valuable funds for Medical Detection Dogs. Group members decide on ways to fundraise and organise their own events with support from Head Office or, where possible, Regional Fundraisers. What is expected of a branch? Anything you raise is brilliant and valuable to the charity. The important thing is for each group to decide on an achievable goal and for everyone to enjoy what they are doing. As long as it is legal, have a go!